With years of knowledge of this business, we present a praiseworthy variety of Computer Table to our customers. Due to their attractive design and perfect finish, these presented products are mostly in acknowledgement in the market. These products are made up from the optimal quality material and futuristic technology. Offered by us is Wooden Computer Table to the esteemed customers, as per their specific requirements. These computer tables are designed in adherence with the international quality standards, with the support of a team of experts. 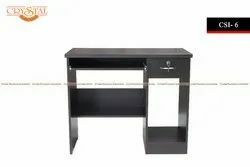 Moreover, wooden computer tables are highly demanded in schools, houses, colleges, computer labs, offices and several other places. Being a noteworthy business enterprise, we are readily indulged in presenting to our customers a comprehensive collection of Computer Table. With steady obligation towards exceptionality, we are readily occupied in presenting to our clients an inclusive consignment of Office Computer Table. As an illustrious corporation of the industry, we are eagerly immersed in presenting a broad gamut of Wood Computer Table to our patrons. PRODUCT FEATURES· 'LEO' is made up of MDF with Mild Steel powder coated in silver frame. · 'LEO' is a computer trolley with casters so that it can be moved easily within the house. · It can also be dismantled and packed in a carton when not in use and can be carried easily while on a move from one place to other. We are offering an extensive collection of Wooden Office Computer Table. Our products meet on universal industry standards and parameters. 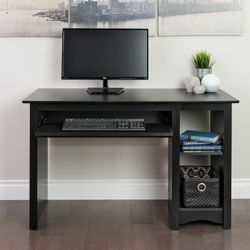 We are providing high quality range of Computer Table. Our range is sourced from well known vendors of the market who are chosen by our procuring agents after complete market research. Our range can be customized as per client specifications. We are one of the renowned companies that provide an exclusive range of Wooden Computer Tables. Experts who have vast industry acquaintance develop our range.